The increased adoption of OSGi is fantastic but it also means more and more people start using it without properly understanding the technology. These people tend to get upset when things do not immediately work the way they expect and blame it on the technology. The clarity of the error messages are therefore an important aspect of the usability. If they are clear and simple to understand people will be easier to get along with the technology. However, dependency graphs with constraints are notoriously difficult to explain in textual messages. 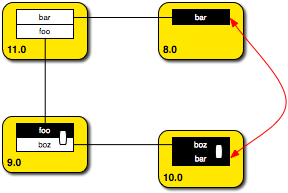 This diagram uses the syntax used in the OSGi specifications. A white box is an import, a black box is an export, a yellow box is a bundle, and the white cylinder in the package boxes is the uses constraint. In this case, module 11 can receive bar objects that are loaded by module 8 as well as module 10, not good. Clearly, any sane person will concur that uses constraints are good because they detect run-time errors early and allow a resolver to prevent these run-time errors from happening. However, how should we report such a complex problem in a log message? that is satisfied by com.acme.eight[8.0]. This clearly is in the right direction but the lack of formatting and the, in my opinion, overly verbose text is still not to my liking. Personally, I like conciseness, it makes it easier to see the problem; verbose template text has a tendency to shut my brain down. However, Richard argues that a lot of people reading the text have no idea what OSGi is and need the verbosity. Not sure, maybe there needs to be an explanation of the problem without the actual arguments or a web page that details what is going on. If you have no clue, I think it is too ambitious to expect an understanding from a mere error message. In the old, long gone days of computing, all error messages had numbers that one could look up, maybe we should start doing that again. A bundle can see classes from the same package via multiple class loaders. could be found and this constraint violation is one of the problems. Richard has not seen this example but he will undoubtedly react. And we would you to react as well because we just do not know what is best. Richard is willing to change the error messages of the Apache Felix framework if people come up with a better solution than we have now. P.S. Richard became a father yesterday of his second child: Brady William Hall. Congratulations! I think you are spot on. I really like the layout of the last error message, where you provide some background information and also visually match up imports and exports. I like the code for the error. I don't like the background info. And I like the import/export graph. The "code for error" makes it easier to search for it over the Internet. This is (still) used by databases to report errors, and it's very useful so you can find possible causes and fixes. I don't like the background info, because that is just adding (mostly) static information that can be looked up. Only the first line seems mutable, as the "user constraint error" sounds too generic. I'd create something like E128.A for this actual case of user constraint violation. But I still believe that the error should be lookup up in a knowledge base (and/or Internet) for further information. The explanatory part is MUCH useful, because it makes it MUCH easier to see the conflict (I guess I'm as visual as you). That includes the "In this case..." and the import/export graph, but I'm just afraid how it would behave in a long chain of dependencies... I guess we would need a parser to get your graphical graph from the text file! I think you are working in the right direction, but you fail to lever the power of the Google search on a short but unique error message. I think this is what all developers do when seeing an error message. Maybe setup and include a unique URL for each problem, where the uninitiated can find background info and possible resolutions. Maybe something for ?lanetOSGI. I like it, too. However I also believe the specific error code should be something that makes it easy to Google for. On my blog some posts get huge amounts of hits, because people are searching for a rare but very specific exception text, making my solution the top hit in Google. So I second Maarten's idea. When I first read your phrasing - and I know OSGi - it read like something *was using a constraint violation* (whatever that would mean), but it took my brain a second to re-arrange the sentence and identify the meaning. Just a minor change, but IMHO could make a big difference in intelligibility. We can improve it further by getting rid of the ldap qualifiers, at least for disjunctive normal form. Which would an average Java developer understand more quickly? IMHO, a textual representation is a bad choice when explaining (dependency) graphs. Have you ever seen a teacher or professor explaining graph problems (exclusively) by writing text on a blackboard? * reduce the textual output intended for direct human consumption to a minimum (error code plus one short sentence). * print a http link to a web page where the user can paste this description to get a full explanation of the problem. The service could be made a standard bundle which is deployed in each OSGi runtime by default, or at least *also* at some prominent public location, so the resolver could include a link to either the public "explain this error" web page, or to the one run locally. Displaying the information in LDAP filter syntax is hard for humans. package= is redundant information and breaking the version range into the LDAP filter syntax is confusing. This seems to be leaking internal constraint modeling details into the error message. Also, the explanation "A bundle can see classes from the same package via multiple class loaders." is, of course, misleading as the uses constraint violation prevents resolution and so the inconsistent class space is never created. The important thing to remember here is that we are discussing the exact content of an exception message, so I question how useful the formatting will be. Regarding LDAP filters, they are definitely not ideal, but they aren't terrible either. And given that they are the Felix resolver's internal model then that's all there is (there is no manifest format in memory). In short, the LDAP filters will have to stay...which is only particularly bad for version ranges. An alternative is to not show the actual offending requirements, so you won't know "the" requirement you'll just know "a" requirement was the issue. However, I find that for debugging purposes it is better to know the requirement, since often it is because attributes or version ranges are incorrect.